The first man’s name was Adam and his wife he called Eve. They lived in a beautiful Garden away in the East Country which was called Eden, filled with beautiful trees and flowers of all kinds. But they did not live in Eden long for they did not obey God’s command, but ate the fruit of a tree which had been forbidden them. They were driven forth by an angel and had to give up their beautiful home. So Adam and his wife went out into the world to live and to work. For a time they were all alone, but after a while God gave them a little child of their own, the first baby that ever came into the world. 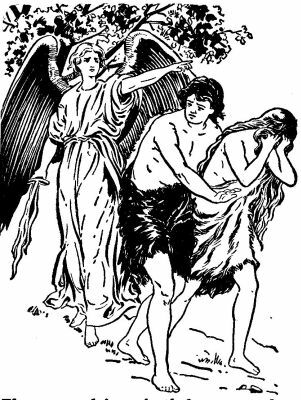 Eve named him Cain; and after a time another baby came, whom she named Abel. When the two boys grew up, they worked, as their father worked before them. Cain, the older brother, chose to work in the fields, and to raise grain and fruits. Abel, the younger brother, had a flock of sheep and became a shepherd. While Adam and Eve were living in the Garden of Eden, they could talk with God and hear God’s voice speaking to them. But now that they were out in the world, they could no longer talk with God freely, as before. So when they came to God, they built an altar of stones heaped up, and upon it, they laid something as a gift to God, and burned it, to show that it was not their own, but was given to God, whom they could not see. Then before the altar they made their prayer to God, and asked God to forgive their sins, all that they had done was wrong; and prayed God to bless them and do good to them. Each of these brothers, Cain and Abel, offered upon the altar to God his own gift. 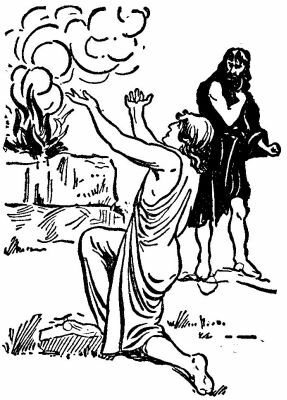 Cain brought the fruits and the grain which he had grown; and Abel brought a sheep from his flock, and killed it and burned it upon the altar. For some reason God was pleased with Abel and his offering, but was not pleased with Cain and his offering. Perhaps God wished Cain to offer something that had life, as Abel offered; perhaps Cain’s heart was not right when he came before God. And God showed that He was not pleased with Cain; and Cain, instead of being sorry for his sin, and asking God to forgive him, was very angry with God, and angry also toward his brother Abel. When they were out in the field together Cain struck his brother Abel and killed him. So the first baby in the world grew up to be the murderer of his own brother. And God said to Cain, “If any one harms Cain, he shall be punished for it.” And the Lord God placed a mark on Cain, so that whoever met him should know him and should know also that God had forbidden any man to harm him. Then Cain and his wife went away from Adam’s home to live in a place by themselves, and there they had children. And Cain’s family built a city in that land; and Cain named the city after his first child, whom he had called Enoch.